Headed into the new format, Virizion/Genesect was a deck that a lot of people viewed as an early candidate for BDIF in the new format. It made sense, Virizion decks saw a lot of success the last week of Regional Championships and with the Catcher errata, Genesect EX gained strength thanks to the utility of its Red Signal Ability which acts as a Catcher when a Plasma Energy is attached from hand to Genesect. Then something happened. 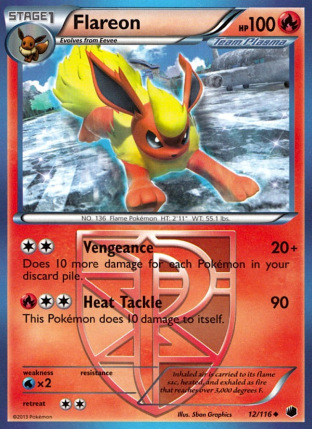 Some non-EX decks seemed to provide challenges to Virizion/Genesect, and then there was the issue of Fire re-emerging as a playable type in the game with Victini EX, Flareon, Ho-Oh EX, and Emboar decks all seeming playable. Virizion/Genesect seemed doomed in the new format. But then League Challenges and City Championships happened, and Virizion/Genesect kept winning, even with all the new threats to it in the new format. Here in St. Louis, it has been the most dominant deck, winning 2/3 League Challenges, and 3/4 City Championships so far. (Most by the same player). What happened to make Virizion/Genesect survive the onslaught of new threats in the format? Well, a lot of those non-EX decks that initially appeared threatening are actually very manageable matchups for the deck, and just needed some strategic understanding to master. Additionally, most of the fire decks actually aren’t that good against the deck, so even when the Virizion players have to play against a fire deck, they still come out on top most of the time. This happened twice during the first weekend of City Championships here in St. Louis. At the first City Championship, a Virizion deck defeated a Flareon deck in the finals. At the second one, a Virizion deck beat a Ho-Oh deck. In the two City Championships I played in this weekend, I went 3-0 against fire decks. I think the one exception is Emboar, I think that one actually does beat Virizion/Genesect almost all of the time. However, this isn’t too big of an issue because Emboar is a bit of a jumbled deck, lacking in consistency and having some issues with a lot of other decks in the format (most notably Garbodor decks). As a result, Emboar shouldn’t see much play. I played Emboar at the second City Championship, and did fine, going 4-1, but bubbled cut, and with Emboar not in cut, the door was open for Virizion to take home the tournament. After seeing Virizion do well at the first two tournaments, my initial reaction was to try to counter it some more. I don’t like Emboar too much, so I started testing Victini EX decks, and decided those were horrible and would probably just lose to Virizion anyhow. From there, I came to the conclusion, if you can’t beat them join them, and started breaking out the Virizion list I put together at the beginning of the format for testing. For this City Championship, we ended up with 21 Masters, which was good for 5 rounds and a Top 8 cut. 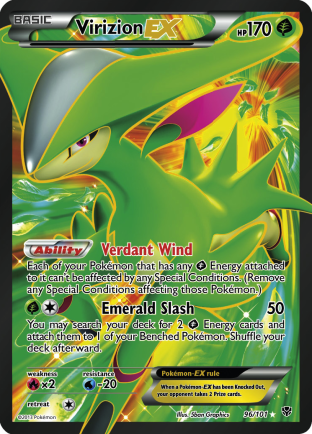 This is a bit different than your standard Virizion/Genesect deck, in that it plays a full count of Deoxys EX and uses that to boost the damage for your attacks. 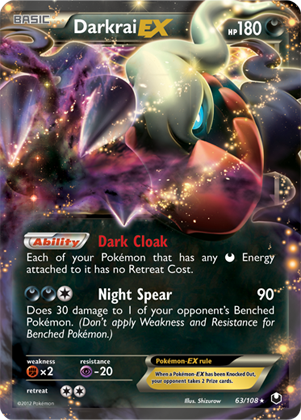 With 2-3 Deoxys EX in play, you’ll be hitting most of the damage numbers you want. 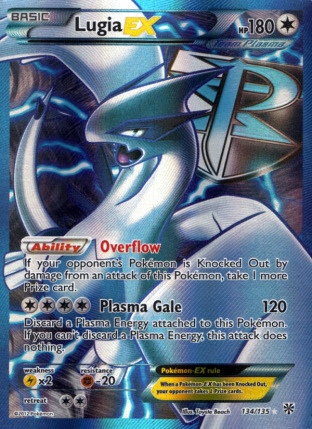 Additionally, with multiple Lugia EX that are being powered by Deoxys EX, the deck has a great matchup against Stage 1 and Stage 2 decks as it just needs to power up a Lugia EX, and that can usually get you at least 4 prizes with Plasma Gale. 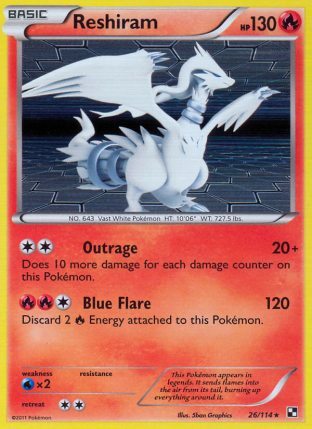 I know Lugia EX isn’t played everywhere, but it’s been a bit of a staple in the St. Louis area, and I think it really helps strengthen a lot of the decks weaker matchups. In this matchup, I got off to a pretty normal start. I Emerald Slashed Energy onto my field, and got Genesect and Lugia EX setup. I believe I knocked out a Thundurus with G-Booster and then a Kyurem for Plasma Gale. From there, I kind of got blindsided by an Absol that got powered up out of nowhere and swung for 190 knocking out my Lugia EX. From there, I never could get anything setup to deal with the Absol and it ripped through my field. By filling the bench with Deoxys, the deck definitely leaves itself vulnerable to big Absol plays, which happened in this matchup. In this matchup, I get to go first, and get the turn 2 Emerald Slash to setup a Genesect EX. I start using Red Signal to manipulate where the damage is going. He is able to knockout my Virizion EX between a combination of a Flareon attack and pound from his Trubbish. From there, I pretty much Red Signal up any Eevee he plays down (he was on edge of getting decked almost every turn and struggled to get more than one down, or hit the Energy needed). After I got down to two prizes, I was able to Energy Switch to power up Lugia out of nowhere and Plasma Gale for my last two prizes. This was a weird Blastoise deck with a lot of weird stuff in it, and he prized all his Squirtles so outside of an annoying Suicune that got G-Boostered, it was a pretty easy matchup. I forget if I got to go first or not in this matchup, but regardless, I got a turn 2 Emerald Slash and had total board control in the matchup, as my opponent didn’t get much Energy in play to do too much damage to me. This just made it a matter of taking some early KO’s with Megalo Cannon, followed by a G-Booster or two, and then finishing up with a Plasma Gale on a Kyurem I believe. This was a weird situation, in that at 3-1, I should almost have been assured at making it into the Top 8 cut, all I had to do was take an intentional draw in the last round to get into cut. Unfortunately, I’m the only 3-1 that gets downpaired, so I have to play my game out and risk not making cut. He gets a turn 2 Blastoise going first, which almost spells out that you’ll lose the game, no matter what deck you’re playing. I never got an Emerald Slash off in this game, but just worked on powering up Genesect EX’s with manual attachments and Colress Machine. I ended up jumping ahead on prizes taking two Megalo Cannon knockouts on Keldeo EX’s. 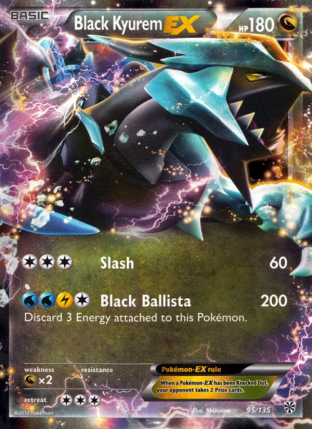 Unfortunately, what the game came down to was me being unable to get the G-Booster/Energy combination on another Genesect EX to seal the game with a G-Booster on a Black Kyurem EX, and instead I got Black Ballista’d out of the game. I ended up bubbling out of the cut at 9th place. 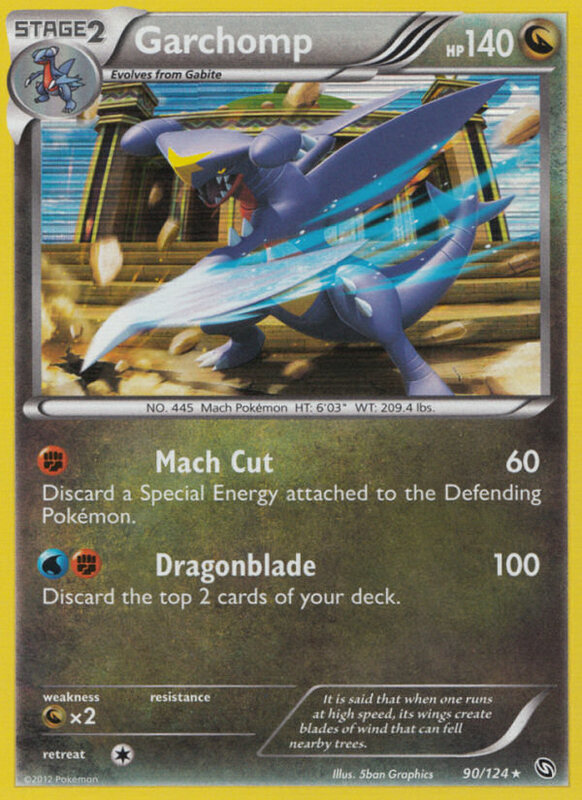 For this one, I wanted to focus on making my deck stronger against Blastoise and Darkrai, as well as try to give myself a bit of an edge in the mirror match. I felt those would be the big three decks to focus on for the next day and built accordingly. This list is pretty crazy, and plays a total of four 1-of attackers. This made the deck more versatile, allowing me to take a variety of different approaches to different matchups. I think having both Mewtwo EX and Bouffalant available gave me a really solid mirror matchup. Mewtwo EX gave me a cheap attacker that could easily be powered up without Emerald Slash (via Double Colorless or Energy Switch) to do some quick and dirty damage. 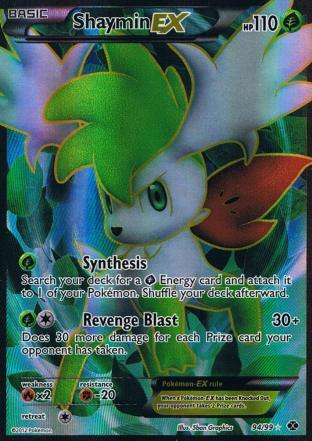 Shaymin EX, similarly could be powered up in one turn with Energy Switch and especially when played in conjunction with N, can sweep through an opponent’s field for your last 2-4 prizes. I also swapped out Colress for Ghetsis, as I wanted to add more disruption to the deck to aide in its matchup against Stage 2 decks and Darkrai decks. 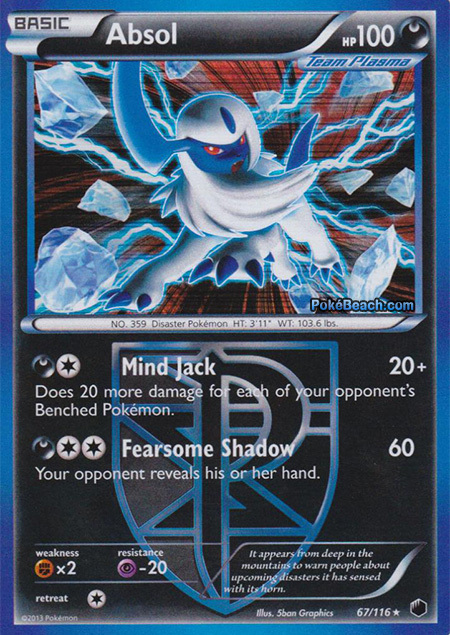 I think a big Ghetsis can straight up win games nearly by itself, making it a very enticing card to play, even if it may hurt your own consistency sometimes. Another Blastoise deck that went first and got the turn 2 Blastoise, which spelled trouble for me. I did get a few attackers powered up with Emerald Slash, and managed to stay in the game with that. But in the end, I only got two Supporters for the entire game, a Professor Juniper on turn one, and then a Ghetsis a long time later. My opponent, conversely, hit a Supporter almost every turn and that type of card advantage was too much to overcome. As my opponent didn’t play Tropical Beach, an N at any point later in the game probably would have won me the game. I tried to wall off with Bouffalant, but ended up losing to an Escape Rope. I go first in this one, and draw the first Emerald Slash, setting up a Genesect EX and Bouffalant. From there, I work on using Gold Breaker for some KO’s. My opponent got turn 2 Emerald Slash as well, but couldn’t find a Genesect or Bouffalant to attach to and in the end was forced to Emerald Slash Energy onto another Virizion EX. This put him too far behind, and I was able to power through with G-Booster to sweep the game. My opponent was playing what seemed to be a straight Virizion/Genesect deck with Deoxys EX and Plasma Badge. He did play Psychic to let him attack with Deoxys EX in the matchup, which can be good in the mirror match. I don’t really have too much going, but I know I can get a turn 2 Megalo Cannon or G-Booster off. So I go for the turn 2 G-Booster, and knockout his Virizion EX before he can Emerald Slash. From there, I work on attaching some to Virizion EX as well as the active Genesect EX, and G-Booster again two turns later, at which points he knocks out my Genesect. I promote Virizion EX and Emerald Slash to my Mewtwo EX. He is forced to just attack into my Virizion with his Genesect EX and N’s me. I get my DCE off of the N and attach it to Mewtwo EX and X-Ball for game. This isn’t the matchup you really want to be playing against with this deck one would think. But one neat thing with this list is that I have 3 non-fire weak attackers in Mewtwo, Lugia, and Bouffalant to work with, so I was able to forge forward without risk of being ohko’d. I ended up starting with Shaymin EX in this matchup, which isn’t the best starter, but it’s workable. I ended up attaching to it, and using Synthesis to accelerate Energy onto my field. From there, I worked on setting up Mewtwo EX, Bouffalant, and Lugia EX, and just traded with all three of those guys throughout the game. Lugia EX in particular was big for gaining me ahead in prizes whenever it took a knockout. I worked the game down to a situation where I pretty much had my opponent checkmated. I had Lugia EX, who was threatening all of his non-ex’s for my final two prizes. And then if he knocked out Lugia EX, I had the win with Red Signal/Revenge Blast on one of his EX’s. I ended up faking out my opponent towards the end of the game. I played a Colress Machine, and failed it, because I wanted to leave that Energy open for either Lugia or Red Signal, and my Lugia was sleeping at that moment and I didn’t have another Virizion EX left in deck to free it from Poison. He ends up just passing with Mr. Mime active I believe. I play Ghetsis, get my last Colress Machine, and play it to get the last Plasma Energy from my deck and Plasma Gale for the game. This is a matchup that I’m fairly comfortable with. It’s a bit more difficult than Straight Darkrai, but I still think it’s in favor of the Virizion player. Basically, what this game came down to, was on turn 2, I used Ghetsis and got rid of my opponent’s entire hand, and then just steamrolled through his energy deficient field. I ended up at 4-1, for 12 points, and actually ended up as the #1 seed because the people who jumped ahead at 3-0 all ID’d the last two rounds, and I was the only one with 12 points. We had quite a few 3-1-1’s (10 points) bubble out. We had 11 people in play for top cut headed into the last round, and instead of playing out there games, almost all of the 3-1’s chose to ID except myself, my opponent, and the 2-1-1 that was downpaired. As a result, 2 of those people who ID’d bubbled cut. This was a matchup that I wasn’t sure what to make of it, since it partially seems to be built to counter Virizion/Genesect decks. I think it played 4 Crushing Hammers to prevent early Emerald Slashes, as well as Enhanced Hammer. In actuality, it was a fairly easy matchup. I just had to promote useless stuff like Mr. Mime and Bouffalant up as I attached Energy to absorb Outrage attacks, and then Laser the Reshiram’s to get them into ko range, and then once the Reshiram’s were out of the picture, I could just easily run through the Terrakion’s with Megalo Cannon. I ended up winning this one 2-0. This was a pretty frustrating matchup to be paired against. I kind of banked on not playing against it, since it didn’t have a presence the previous day and hasn’t had much of a presence in the meta game as a whole, but it’s still a very good deck. The Shaymin EX tech slot was being debated as being a Deoxys EX, which makes the Empoleon matchup immensely easier, but I didn’t think I would play against it and thought Shaymin EX would be better on the whole. Game 1, I ended up winning by getting an early Lugia EX and just using Plasma Gale for all six prizes. Game 2, he completely wrecked me, I never got Emerald Slash off and it was very one sided and I just took time to figure out as much about his list as possible even though I knew there was no comeback hope. Game 3 played out in a fairly back and forth manner. I didn’t quite get the start I needed, while he setup relatively fast. Late game, I used Ghetsis on him and saw he had nothing really useful in his hand, and was setting up for a Plasma Gale for game the next turn. I hit into it with Emerald Slash and start setting up for that Plasma Gale for game with that damage. He gets a Max Potion to remove that damage unfortunately, and uses attack Command. My only hope is for something to try to get Red Signal/Plasma Gale off this turn, and don’t get it, and promote Bouffalant, trying to setup that play for the next turn. He rips a massive turn, getting out Dusknoir, and Escape Ropes to bring up an EX for game. All in all it was a pretty good tournament run. I just didn’t have a favorable enough bracket to go deeper. If I wasn’t playing against that Empoleon, I would have been playing against Hydreigon with multiple Sigilyph which also wouldn’t have been a good matchup. So my day ended there with a 3rd place finish. One neat thing about the Chicago area tournaments is that they have been largely concentrated around holiday weekends. My family is in Wisconsin, so I’ve been able to hit up tournaments on my travel day back for both Thanksgiving and Christmas. For this tournament, I was pretty intent on playing Gothitelle, based on the meta I saw when I was up on Thanksgiving, and had my deck list and everything filled out to play it. But then I talked to another St. Louis player who made the trip up, and he said that Virizion stuff had been big there and not to play it, so I scrapped it, and filled out my deck list for my Virizion/Genesect deck again and went with that. I wasn’t sure what their lists would look like here, but I felt with Bouffalant, Mewtwo, and Lugia EX I would be in a solid position for mirror, and I like the matchups against the rest of the field minus Emboar, so I felt like it would be a safe choice for the day. We ended up with a massive 60 Master’s division players, making for six rounds with a Top 8 cut. I didn’t have large expectations for playing in such a difficult tournament, it was by far the biggest City Championship I’ve played in. The one good thing about that though is it kind of takes some pressure off when you’re not expecting to do well, but just playing and letting the chips fall where they may. I went first in this matchup, and nearly Laser donked his Gible, but he managed to get another Basic out. From there, I got a turn 2 Emerald Slash knock out and began setting up Genesect and Lugia EX, using Red Signal to bring up small guys for the knockout. Because of my early pressure, he was just scrambling to continue streaming Gibles and Gabites. He does get some Garchomp’s out that I can’t OHKO, and I just work on setting up snipe damage on his Pokemon to put all of them in range for Plasma Gale knockouts, and then force him into a position where anything he has active will be Plasma Gale’d for game, and I do just that on his Garchomp for the 6-0 win. This probably isn’t a good matchup. Bouffalant is my only non-EX attacker, and G-Booster can only take you so far. But I use Shadow Triad in conjunction with Colress Machine to setup a turn 2 Plasma Gale on his Klink, to jump ahead two prizes. From there, I just Plasma Gale his Keldeo EX twice to bench him. I go first in this matchup, attach to Virizion EX, and use Hypnotoxic Laser on his Trubbish. He plays an N, doesn’t get another Pokemon, and I’m able to knock his Trubbish out for game. This was a good matchup to see in what was essentially a play in for top cut, as you could ID your last two rounds to make Top 8. My opponent was none other than Pooka from the Top Cut, and the game was streamed, so it was a good experience to have this game. I don’t remember too much from the match, except that he played Silver Mirror, so I had to be smart in not leaving myself without an option for knocking out a Silver Mirrored Absol, otherwise it could run through my field. I think I got off to a very good start, with a turn 2 Emerald Slash, along with Hypnotoxic Lasers to start taking prizes on his Trubbish and Sableye’s, as well as build up my attackers. After taking two knockouts on some smaller stuff, he had a Sableye Active I believe, and I was able to drop a Lugia EX and set it up in one turn with Energy Switch and Colress Machine to Plasma Gale to go up 4-0 on prizes. I think I knocked out his Absol next, and then he started to take prizes, and set it up so that he had a win readying if I misplayd in promoting my Genesect EX that he sniped damage to. This game went to time, and we ended up in a tie. Just couldn’t find my G-Booster to blast through a Darkrai EX or Sableye or something with Silver Mirror. I got to go first, which is great for the mirror match, and I think my opponent mulliganed a few times, which was good for me. I just Emerald Slash, and use Red Signal to bring up a variety of Pokemon and put them all at 50 damage, while simultaneously setting up a Genesect EX and Lugia EX. It didn’t go as smooth as just taking back to back Plasma Gale’s for game, but in the end I was able to win the game just by using Plasma Gale on two EX’s for 6 prizes. One really funny thing about this game is my opponent asked to see my discard pile midway through the game, and all that was in there was two Energy. I didn’t really have any draw for most of the game, but was still able to setup just fine because I started Virizion EX and had attackers to power up, and Energy in hand to get it going. I had a Shadow Triad in my opening hand which was useless, and the only Supporter I played was a Ghetsis for 2 cards, yet I still managed to win the game pretty handily. From there, we looked at the standings, and there was no way to whiff cut at 4-0-2, so my opponent and I agreed to ID, putting us both into the Top 8. I don’t remember too much of these games. Virizion mirror matches kind of blend together. They’re very back and forth, and G-Booster and N make them very volatile, allowing them to radically swing direction very fast. 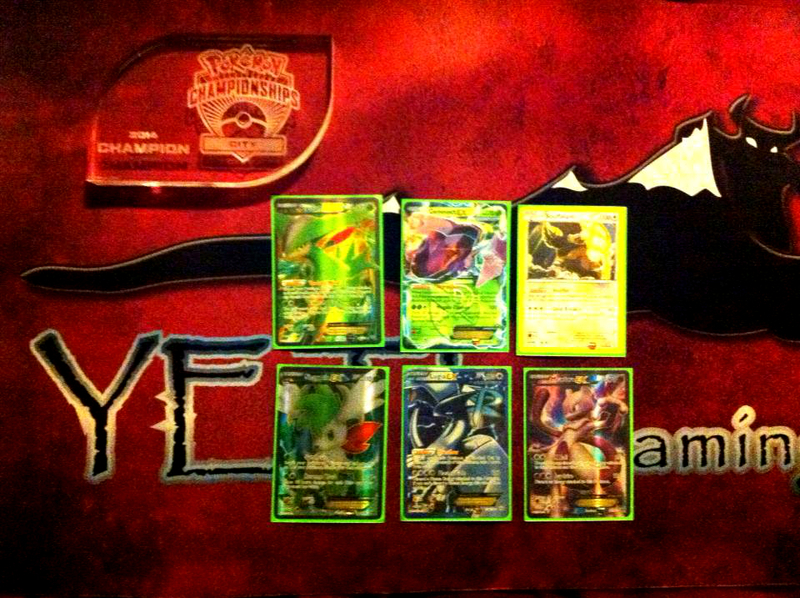 In game 1, I think I took 3 prizes with Plasma Gale and a knockout with G-Booster to jump ahead 5-0 on prizes. My opponent N’s me, and starts putting damage on my board, and eventually takes a knockout. My win condition is a Grass Energy to G-Booster for game. My opponent then gets his G-Booster off the first knockout and blasts away at something for the knockout. From there, I top deck a DCE, which won’t fulfill the energy requirement for G-Booster and I lose. Next card in the deck, the would be game winning Grass Energy. In Game 2, my opponent’s deck stutters a bit, and I sit in a comfortable position all game, playing from ahead (as is natural when you go first in the mirror match). At one point, my opponent used Ultra Ball to get Deoxys EX, but missed that his Psychic Energy was prizes, and couldn’t do anything with the Deoxys to respond to my Genesect, getting that instead of Bouffalant. I don’t think it mattered in the long realm of things because my board was so developed and I had Plasma Energy to Red Signal whatever he put Energy on to try to respond to my Genesect with. In Game 3, time was called fairly early, so the game basically turned into who could score the first knockout. The short of it, he prized his G-Booster, and I didn’t and was able to Skyla for G-Booster on turn 3 for the win. I don’t remember Game 1 too much, but it was a pretty even affair for the most part, but my opponent did pull ahead a bit, so I had a bit of catch up to do. We both get down to 2 prizes, and the best out for me to win seems to be Shaymin EX’s Revenge Blast, so I put up Bouffalant, and attach a Grass to Shaymin EX on my bench, and N him to 2. He draws Plasma off the N to Red Signal for game. In game 2, I believe I lead comfortably for the entire game and have a fairly easy win. In game 3, it’s a fairly back and forth exchange, but my board is much better developed. It comes down to him knocking out my Genesect EX with his Bouffalant shortly after time was called to even us up at two prizes. I attach a third Energy to my Mewtwo EX and X-Ball his Bouffalant to go down to one prize. He has no Energy left on his field and the game is mine, I think even if time wasn’t called since he didn’t play a Mewtwo of his own and it would have been near impossible for him to recover from that board state. I was pretty happy not to have to play another mirror match again. Having played Pooka in Swiss, and having him basically draw through his entire deck in our Swiss game, I had a pretty good idea of what to expect. In game 1, what this game came down to was on around turn 3, I played Ghetsis, getting rid of his entire hand. From there, I had complete control of the game and just took knockout after knockout until I either took six prizes or benched him. Game 2 was a much longer and thought provoking game. I get off to a pretty good start, and have the early Emerald Slash to start setting up my field as well as take some knockouts on his little guys along the way. 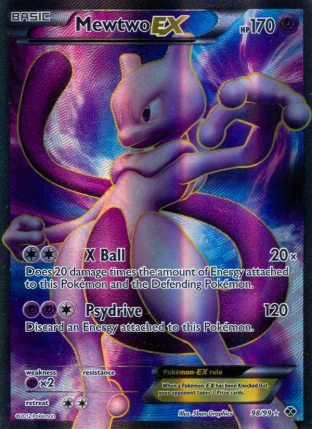 I actually started my attack with Mewtwo’s X-Ball, as I started the game with it, but used an Energy Switch to go into Virizion EX down the road to further setup my field. The way I choose to setup my field is to just go all in with two attackers for the game, I setup a Genesect EX with 4 Energy, and a Mewtwo EX with 8 Energy. What I wanted to do with the Mewtwo EX is basically say, if you try to attack with Darkrai EX, Mewtwo is knocking that out. The Virizion EX would be knocked out, so basically, two EX’s would be what would need to power me through the game. I also had Bouffalant on my bench, which I could try to setup with Energy Switch if needed too to throw a wrench in the prize trade. He used Night Spear, and snipes 30 to my Genesect EX. 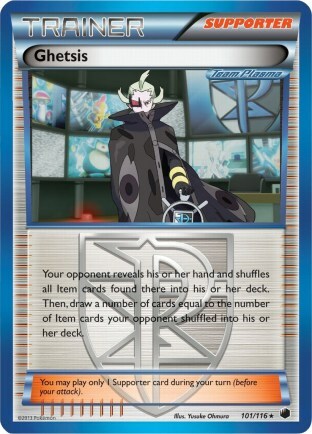 I use X-Ball to knock out the previously damaged Darkrai EX. He uses Junk Hunt to get back his Silver Mirror and something else, and poisons my Mewtwo EX. I think I switch here, try to Red Signal his Absol (but Garbodor is in play haha), so instead just X-Ball his Sableye to go down to 2 prizes. He Mind Jacks my Mewtwo EX, and puts Silver Mirror on his Absol. I use Skyla, and grab my G-Booster, and G-Booster the Absol to go down to one prize. He has no Energy on his field and no access to Tool Scrapper, and is running low in his deck as well, so I figure I can probably just win on deckout as I don’t think he had any Energy on his field. He plays down a Sableye, uses Hypnotoxic Laser, but it’s tail, he attaches to Sableye, and uses Confuse Ray…heads! I have Professor Juniper in hand, so I feel pretty confident I can still pull off the win that turn looking at my hand. I top deck the Switch, which is the card I wanted (that or another Energy to retreat). I play down my Shaymin EX, switch to it, and then play two Energy Switch and Revenge Blast his Sableye for game. This was a fun way to end the tournament. Before the top cut, I was joking about how I never get to use Shaymin EX, even though I think it’s a good card. I was told don’t worry, I’ll get to use Revenge Blast at some point, and when I do, it’s going to be huge. And a tournament winning Revenge Blast is about as big as it gets I think. So far in my going on three year Pokemon career, I have never won a City Championship. The best I have been able to do is five 3rd place finishes, some Top 4’s and Top 8’s. Go figure my first win at one of these events would be in the biggest City Championship I played in against one of the best players in the world in the finals. I think the results from City Championships across the nation so far make it clear, Virizion/Genesect EX is the BDIF for City Championships. This may change as the meta game evolves headed into Regional Championships, but I think there are a few things that should keep Virizion/Genesect EX in the midst of Tier 1 during those tournaments, even as more hate will surely come out of the woods to combat it. First of all, the deck is low maintenance. Basically all you need to get going is Virizion EX active, some Energy to get off Emerald Slash, and something to power up with those Emerald Slash. From there, your deck is generally more consistent in the late game, as you pull all the Energy out of your deck, leaving you with the Special Energy you use for Red Signal or for a non-prohibitive discard with G-Booster (the DCE’s), Supporters, and Items, all of which you want to see later in the game. 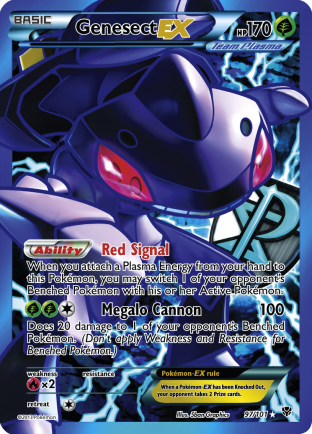 There are other low maintenance decks such as Big Basics in the format, but what those decks lack is a powerful punch, which this deck has with Genesect EX being able to hit for not only 100 damage with Megalo Cannon, but also 200 damage with G-Booster. All of that is accessible after just one Emerald Slash. So on turn 3 of the game, you can transition to some heavy damage, while still having minimal setup and not needing much draw. 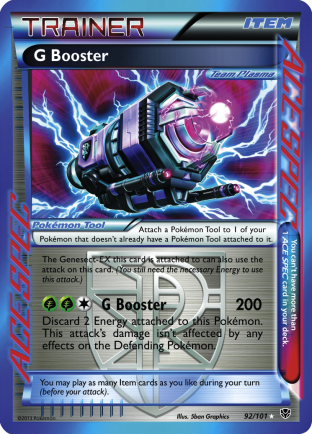 Hypnotoxic Laser has also been one of the most impactful cards in the game since it came out in Plasma Storm, and outside of Garbodor matchups, this deck is unaffected by it, while at the same time being able to abuse it. Virizion EX is able to pick off lower HP guys with Emerald Slash in conjunction with Laser, and Emerald Slash + Megalo Cannon with a Virbank/Laser combo will 2HKO all EX’s. Additionally, having access to a reliable Gust effect that most other decks just don’t have after the Catcher nerf is another advantage of playing the deck. You can knockout exactly what you want more so than with other decks. G-Booster is also perhaps the best attack in the game. Since you can load on extra Energy with Energy Switch and Colress Machine, as well as have a trivial Double Colorless dicard with the attack, it is surprisingly easy to stream multiple turns in a row. The set of attackers available for the deck to use is also top notch. Genesect EX is great for all the reasons listed above. Bouffalant is great for finishing off EX’s after an Emerald Slash. 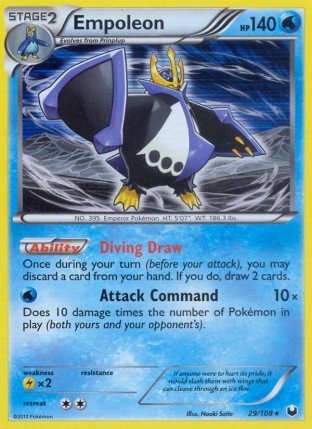 Lugia EX can do the same, while also netting you an extra prize, and turning non-EX’s into two prizes. Mewtwo EX is insanely strong, and gives you an option to power up an attacker with one attachment. Shaymin EX is great for checkmating your opponent or sweeping through your opponent’s field with a late game N, and can now be setup out of nowhere with Energy Switch. I think the biggest mistake most players make with the deck is thinking that it plays out very linearly and is a mindless deck to play, which I don’t think is the case at all. From my experience with the deck, each game is a unique experience, and there are so many different paths to victory that you can take. The amount of damage numbers this deck can hit lends to this mindset in regards to the deck. On the low end of damage, you have the 20 snipe damage from Megalo Cannon. Then you have 30 damage with Revenge Blast, 40 damage with X-Ball (as well as all additives of 20 after that), 50 damage with Emerald Slash, 60 damage with Gold Breaker and Revenge Blast, 90 damage with Revenge Blast, 100 damage with Megalo Cannon, 120 damage with Plasma Gale, Gold Breaker, and Revenge Blast, 150 damage wth Revenge Blast, 180 damage with Revenge Blast, and 200 damage with G-Booster. On top of that, you can add up to 30 damage to any of those attacks with Hypnotoxic Laser. With all of those factors in its favor, I think it’s safe to say that Virizion/Genesect will hold onto a Tier 1 spot headed into Regional Championships. Fantastic artical as usual Andrew. Keep it up! Congrats on the wins, I am surprised the list you won the Cities with, only ran 2 energy switch, especially with the multitude of attackers that would benefit from an extra energy here or there per turn. Well played though, seems as if you drew the right cards at the right time. Love the writing. Ive been debating running a more attacking list like this, or one with a few Deoxys in it to hit magic numbers with Genesect and Virizion only. Any recommendations? Been playtesting with my group and Yeti as well as a Dark/Hydra w/ Latias, Victini just roll this deck. (Mainly cause Hydra w/ Bangle is gg) Trying to find ways around it.